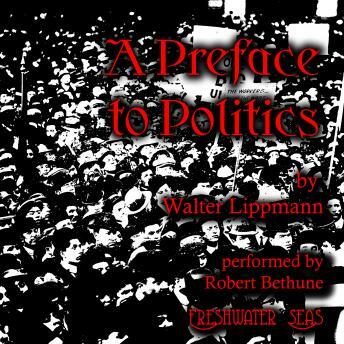 Walter Lippmann still stands today as one of the foremost figures of American political journalism, social commentary, and cultural criticism. At the age of 24, he published A Preface to Politics; that same year, along with Herbert Croly and Walter Weyl, he founded The New Republic magazine. In short, he burst upon the scene. He went on to become an advisor to Woodrow Wilson and was involved in drafting Wilson's famous "Fourteen Points." He won the Presidential Medal of Freedom in 1964, the Pulitzer Prise in 1958 and again in 1961. The fundamental message of A Preface to Politics is that statesmanship cannot succeed if it focuses merely on the forms and mechanics of government and the technical development and administration of policy. Political leadership can only be successful if political leaders attune themselves to the human beings they lead, keeping themselves abreast of their wants and needs and the social and cultural movements among them. No political mechanism can function without intelligent, perceptive, and responsive people to make it work. It is startling to see how relevant, indeed important, Lippmann's message still is, over a century after it was written. In our day as in his, deliberate lies and deception is the rule in the highest offices of our government. He saw the same fundamental corruption at work in our national politics as still pollutes it today. Then, as now, he emphasizes the vital importance of informal leadership exercised by educated, informed, energetic people who function as activists and visionaries in the endless process of maintaining a responsive society and government. Over and over again, Lippmann's message will make us open our eyes to what is still critically important.